2 of 3 | Posted by: dklepetka@hotmail.com. Doreen Bohn, 81, Wahpeton, ND formerly of Great Bend, ND, passed away on Monday, October 21, 2013 at Sanford Health, Fargo, ND. Funeral services will be on Thursday, October 24, at 10:30 AM at Trinity Lutheran Church, Great Bend, ND with Rev. Sean Daenzer officiating. Visitation will be on Wednesday from 5 PM to 6:30 PM with a prayer service at 6:30 PM at Willow Creek Chapel, Wahpeton. There will also be visitation one hour prior to the service at the church on Thursday. Interment will be at Trinity Lutheran Cemetery, Great Bend. Arrangements are entrusted to Vertin-Munson Funeral Home, Wahpeton, ND. 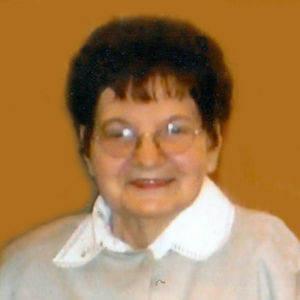 Doreen was born on December 9, 1931 to Ewald and Bertha (Hingst) Bohn near Great Bend, ND. She was baptized, confirmed, and a lifelong member of Trinity Lutheran Church in Great Bend. Doreen lived on the home farm near Great Bend with her parents until they passed away. At that time she moved to Wahpeton, ND and has resided there currently. She was a dietary aid at St. Francis Home in Breckenridge, MN until her retirement. Doreen was quiet spoken, a great listener and gardener and will be greatly missed by her family and friends, especially her morning coffee gals. Doreen is survived by her nephews, Paul (DJ) Dichraff, Mesa, AZ, Tim (Cathy) Ford and family, Fargo, ND; her nieces, Cheryl Woodruff, and Jo (Tim) Matz, both of Wahpeton, ND; her great-nieces and nephews, Brandon (Carrie) Woodruff and girls, Garrison, ND, Kristy (fiancé, Scott Karkula) Matz, Denver, CO, Ryan (Sarah) Matz, Phoenix, AZ, Kari (Michael Hresko) Matz, Fort Collins, CO, Kelsey (Guy) Turner, Green Bay, WI, and Garrison Dichraff, LaCrosse, WI. She was preceded in death by her parents, her two sisters, Marlys Ford and Adeline Dichraff, her two brothers, Dennis and Darryl in infancy, her brother-in-law, Hank Dichraff, and many aunts, uncles, and cousins. The beautiful and interactive Eternal Tribute tells Doreen's life story the way it deserves to be told in words, pictures and video. Jo, Tim, Cheryl and Paul and families - My thoughts and prayers are with you during the loss of Doreen. I have wonderful memories of her with Hank & Adeline while growing up. She was a special lady. She is your angel is heaven. Cherish the memories.